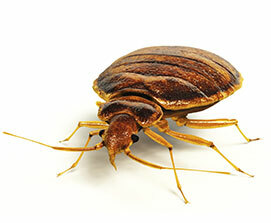 Bed Bugs: Avoid these unwanted guests in your home! Bed bugs are one of the most challenging pests to remove from your household – so make sure you are not accidentally inviting these insects into your home. It is important to know how to prevent and identify bed bugs, and give your home the very best chance to be pest free. Bed bugs are small insects approximately ¼ of an inch long. They can be a variety of colours including off white, tan, brown and even a burnt orange colour. They have very small heads in relation to their body, with six legs and two antennae. As their name describes, bed bugs are often found in our near our beds. However, they also like drawers of clothes, upholstered couches and chairs, thick carpets, towels and curtains. It is important to understand the ways that bed bugs may enter your home. Most commonly, bed bugs will migrate into the home with you and your belongings. If you have been on vacation or staying somewhere else, bedbugs may come home with you on your luggage, computer, clothing or other belongings. This risk is much higher if you have traveled on public transportation, as the chances of contact with bed bugs is much higher in high traffic areas. Sometimes bed bugs may be introduced to the home by animals such as dogs, outdoor cats, bats and birds that may end up in your home. If you are staying somewhere new, check the environment for bed bugs, whether it be a hotel or a friends place. Look at the mattress under the sheets for bugs along the seams or small blood spots. Inspect the headboard along with any other upholstered furniture. Leave your luggage outside the room until your check is complete, and do what you can to avoid putting your suitcase on the bed for the duration of your stay. Anytime you have been away from your home for an extended period of time, check all of your belongings for bed bugs – before you enter your home! It only takes a few minutes before bed bugs will make themselves comfortable on your bed or couch. If you feel that there is any risk of bed bugs in your items, use a vacuum on items that cannot be washed, or hand wash items with hot soapy water. You should be looking for the bugs, and potentially their eggs as well. Any items that can be washed in the washing machine should be cleaned at the highest possible temperature. This entry was posted in Blog on 2015/03/10 by Any Pest.